Building a custom tree house is a journey that the tree and you take together. The result is quite remarkable as the structure and tree become one. An inherently creative process; tree house construction is much deeper than any list of steps; its essence cannot be captured in a "how-to" manual. Building a tree house is a dream, an obsession, an escape, a work of art and an emerging science. We like to sum it all up by saying that tree house building represents freedom. Treehouses give us freedom from gravity, freedom from our obsession with industry, and freedom from traditional mundane structures. Not only does the building process fulfill various personal goals and purposes, but the methods of construction are equally diverse. Here we'll give you some background information and explain how the Tree Top Builders process works. A Custom Tree House that is Uniquely "You"
Some teenagers and kids build treehouses with stolen lumber from building sites. Some cities and arboretums hire professional treehouse companies to engineer and precisely build sophisticated tree houses and structures. Engineers tend to push the limits with their personal experiments, often creating spheres, futuristic or extra-terrestrial dwellings, or 8th wonder of the world candidate concepts because they like the design challenges. Part of the liberating aspect of this process is that it's your masterpiece. Perhaps you want your tree house to reflect the glory and splendor of the the Lord of the Rings tree houses, Swiss Family Robinson's famous house, or even the houses and rope bridges in the Ewoks' village. Or perhaps you have a particular, personal inspiration for your design to make it your own. Great! Now you have vision and it's time to talk about construction methods. It should come as no surprise that building methods also vary. Many do-it-yourselfers will build tree houses out of whatever they can buy at their local big box home improvement retailer. A welder tends to build metal supports. An arborist tends to use cables. A carpenter defers to wood. Engineers, well, their tree houses are in a class of their own. As seasoned, professional builders, we want to listen to your ideas and inspiration and create a structure that you will be thrilled to call your own. No matter what the theme or inspiration for your tree house and/or its accessories, you can be sure that Tree Top Builders will build yours to the highest safety and quality standards. The biggest difference is that foundations of tree houses are set in living and growing organisms rather than concrete. Once the fasteners are installed and the beams are attached to the custom brackets, tree house construction can be a lot like regular construction. You build a deck on top of the beams, then walls, a roof, siding, windows and finishing touches. The exception is when you have branches penetrating through walls or the roof. This is very tricky because the tree has to be allowed to grow and sway, so a tight seal is really close to impossible. Most tree house builders agree that houses with holes in the roof will leak at least a little. The more furrowed the bark, the more water will get in. You've got to keep all rafters and framing away from the tree to allow it to sway in a storm. Then, you need to fashion some kind of a flange that can be bungeed or tacked into the tree and floated over a custom made pipe collar nestled into the roofing. Not an easy task to perfect, even for a full time roofer or a seasoned treehouse builder. To be honest, it adds a lot of expense to the project, so we avoid it where possible - especially for tree houses that are finished on the inside such as tree house bed & breakfasts or semi-permanent tree homes. We once built a house in a Norway Maple with 7 roof penetrations and 2 wall penetrations. It was either that or cut so much of the tree back that we would have been concerned about its long term viability. If that's the only kind of tree you have, we suggest building off to the side of the tree or making it only a tree house platform instead of building walls and a roof. For safety and efficiency during construction, it is usually best to do as much work as possible on the ground. Cut boards on the ground and pass them up to the treehouse. Even frame and side a wall and hoist it up with pulleys and ropes. This will reduce the amount of items dropped, reduce climbing and ladder fatigue, and will also be faster in many cases. In some cases, your entire custom tree house can be built in our workshop and transported in sections to the tree. Typically, however, we build at least the platforms on site. The tree house construction industry is vast and largely unregulated and undefined. There are no overarching associations or trade guilds for professional builders. There are conferences and several workshops designed to teach people to build their own tree houses, but the building companies are only loosely associated if at all. Essentially, anyone can build a website, hang out their shingle, and call themselves a tree house builder these days. This is both exciting and dangerous. It's exciting because tree house building is creative and expressive and in its formative stages now. It is dangerous because you don't always know the difference between an experienced, quality expert and a "professional tree house builder" who doesn't have a full understanding of his craft. The average person looking to hire a tree house builder is not going to be able to tell the difference based upon pictures of completed projects. How much damage will a certain support structure will do to a tree over time? What are the tree house fasteners are rated for? What safety factor will the project have? These are questions that a legitimate, experienced expert should answer relatively easily. Remember that while custom tree houses are awesome and inspiring, they also need to be built safely, and an inexperienced builder may be better suited to work for an expert, quality tree house building company like us for a few years before branching out on their own. Although we are not sure, we expect that over 95% of tree houses are NOT built by industry professionals. This is largely because custom tree house building experts are limited and the closest one could be 1000 miles away! Another reason is the significant cost of quality professional building services. And finally, some parents want the tree house to be a family construction project. We can't confirm our 95% guess because very few tree structures are permitted and there would be no way of counting them. Tree Top Builders has built over 100 treehouses as of late 2008, but we suspect that there are probably over 500,000 tree houses in the United States, mostly built by do-it-yourselfers for basic kids' tree houses. We also suspect that most were started by do-it-yourselfers are never finished. This is partly because of the nature of do-it-yourself projects, but also because we see tree houses as we're driving around the country and often stop in to meet the owners, check out the creativity, quality, and safety and study how their structures and their trees have held up over time. It's safe to say that of larger custom tree house construction projects, a higher percentage of them are built by professionals. Have more questions on building tree houses - visit our FAQ section. 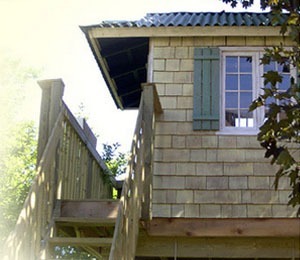 Are you ready to start building your own custom tree house - contact Tree Top Builders!